View the entire table of contents for the Nov. 30, 1998 issue. November 30, 1998 Exciting New Red Blend From Paso Robles Two Napa Valley wine-making veterans have just released a new red wine from Paso Robles, hoping to throw a brighter spotlight on an emerging California vineyard region. 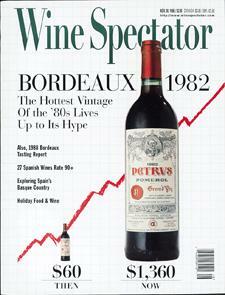 For the full article, check out the new issue of Wine Spectator, on newsstands November 30, 1998.